CALGARY, Oct. 4, 2018 /CNW/ - Source Energy Services Ltd. ("Source") announced that its sand sales volumes for the third quarter of 2018 were 726,000 metric tonnes ("MT"). Approximately 94% of these sales were made through Source's Canadian distribution network and the majority utilized Source's last mile logistics services where Source delivered sand directly to customers' wellsites. This brings Source's 2018 nine-month sales volumes to 2,182,000 MT. While Source's quarter over quarter Canadian sand sales volumes were largely unchanged from Q2 to Q3, the 11% decline in sales volumes was primarily due to a reduction in Source's US based mine gate sales. As we move into 2019, Source expects that WCSB activity levels will substantially improve from Q4 of 2018. The addition of Montney and Duvernay customer contracts, refreshed capital budgets from E&P companies and continued positive economics for Montney and Duvernay production provide Source with confidence that its 2019 sales volumes will exceed those seen in 2018. 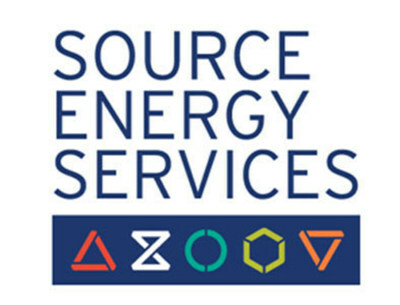 Once Source's E&P customers' capital budgets are finalized, Source will have better certainty as to the amount of growth that might be expected. Source will also have a better view of the impact of the recent LNG Canada announcement on 2019 WCSB completion activities. Sand sales volumes as reported in this announcement consists of a combination of sales made through Source's Canadian distribution chain, at customers' wellsites and at Source's mines. Source cautions that in addition to the location of sand sales, numerous other factors can impact Source's operating results and that a particular trend in total sales volumes may, or may not, indicate a trend in, or be indicative of, Source's financial performance. Source intends to continue to provide updates on sales volumes shortly after the end of each quarter. Source is also pleased to announce that its third quarter financial results for the period ending September 30, 2018, will be released following the Toronto Stock Exchange market close on October 31, 2018. A conference call has been scheduled for 7:30 am MST (9:30 am EST) on November 1, 2018 for interested analysts, investors and media representatives. Certain statements contained in this press release constitute forward-looking statements relating to, without limitation, expectations, intentions, plans and beliefs, including information as to the future events, results of operations and Source's future performance (both operational and financial) and business prospects. In certain cases, forward-looking statements can be identified by the use of words such as "expects", "estimates", "forecasts", "intends", "anticipates", "believes", "plans", "seeks", "projects" or variations of such words and phrases, or state that certain actions, events or results "may" or "will" be taken, occur or be achieved. Such forward-looking statements reflect Source's beliefs, estimates and opinions regarding its future growth, results of operations, future performance (both operational and financial), and business prospects and opportunities at the time such statements are made, and, except as may be required by law, Source undertakes no obligation to update forward-looking statements if these beliefs, estimates and opinions or circumstances should change. Forward-looking statements are necessarily based upon a number of estimates and assumptions made by Source that are inherently subject to significant business, economic, competitive, political and social uncertainties and contingencies. Forward-looking statements are not guarantees of future performance. In particular, this press release contains forward-looking statements pertaining, but not limited, to: outlook for operations and sales volumes; industry activity levels; rail service; the impact of weather; expectations regarding increased demand for and sales volumes of sand in 2018 and 2019; a decrease of sand sales volumes and sand spot pricing in the remainder of 2018; and continued use of increased sand intensities for Canadian well completions in 2019. By their nature, forward-looking statements involve numerous current assumptions, known and unknown risks, uncertainties and other factors which may cause the actual results, performance or achievements of Source to differ materially from those anticipated by Source and described in the forward-looking statements. With respect to the forward-looking statements contained in this press release, assumptions have been made regarding, among other things: proppant market prices; future oil, natural gas and natural gas liquids prices; future global economic and financial conditions; future commodity prices, demand for oil and gas and the product mix of such demand; levels of activity in the oil and gas industry in the areas in which Source operates; the continued availability of timely and safe transportation for Source's products, including without limitation, rail accessibility; the maintenance of Source's key customers and the financial strength of its key customers; the maintenance of Source's significant contracts or their replacement with new contracts on substantially similar terms and that contractual counterparties will comply with current contractual terms; operating costs; that the regulatory environment in which Source operates will be maintained in the manner currently anticipated by Source; future exchange and interest rates; geological and engineering estimates in respect of Source's resources; the recoverability of Source's resources; the accuracy and veracity of information and projections sourced from third parties respecting, among other things, future industry conditions and product demand; demand for horizontal drilling and hydraulic fracturing and the maintenance of current techniques and procedures, particularly with respect to the use of proppants; Source's ability to obtain qualified staff and equipment in a timely and cost-efficient manner; the regulatory framework governing royalties, taxes and environmental matters in the jurisdictions in which Source conducts its business and any other jurisdictions in which Source may conduct its business in the future; future capital expenditures to be made by Source; future sources of funding for Source's capital program; Source's future debt levels; the impact of competition on Source; and Source's ability to obtain financing on acceptable terms. A number of factors, risks and uncertainties could cause results to differ materially from those anticipated and described herein including, among others: the effects of competition and pricing pressures; risks inherent in key customer dependence; effects of fluctuations in the price of proppants; risks related to indebtedness and liquidity, including Source's leverage, restrictive covenants in Source's debt instruments and Source's capital requirements; risks related to interest rate fluctuations and foreign exchange rate fluctuations; changes in general economic, financial, market and business conditions in the markets in which Source operates; changes in the technologies used to drill for and produce oil and natural gas; Source's ability to obtain, maintain and renew required permits, licenses and approvals from regulatory authorities; the stringent requirements of and potential changes to applicable legislation, regulations and standards; the ability of Source to comply with unexpected costs of government regulations; liabilities resulting from Source's operations; the results of litigation or regulatory proceedings that may be brought against Source; the ability of Source to successfully bid on new contracts and the loss of significant contracts; uninsured and underinsured losses; risks related to the transportation of Source's products, including potential rail line interruptions or a reduction in rail car availability or the impact of weather; the geographic and customer concentration of Source; the ability of Source to retain and attract qualified management and staff in the markets in which Source operates; labour disputes and work stoppages and risks related to employee health and safety; general risks associated with the oil and natural gas industry, loss of markets, consumer and business spending and borrowing trends; limited, unfavourable, or a lack of access to capital markets; uncertainties inherent in estimating quantities of mineral resources; sand processing problems; and the use and suitability of Source's accounting estimates and judgments. Although Source has attempted to identify important factors that could cause actual actions, events or results to differ materially from those described in its forward-looking statements, there may be other factors, including those described under the heading "Risk Factors" in the AIF, that cause actions, events or results not to be as anticipated, estimated or intended. There can be no assurance that forward-looking statements will materialize or prove to be accurate, as actual results and future events could differ materially from those anticipated in such statements. The forward-looking statements contained in this press release are expressly qualified by this cautionary statement. Readers should not place undue reliance on forward-looking statements. These statements speak only as of the date of this press release. Except as may be required by law, Source expressly disclaims any intention or obligation to revise or update any forward-looking statements or information whether as a result of new information, future events or otherwise.